For many people, losing hair can be an extremely worrying experience. This is made even more harrowing if you’re unaware of the reasons behind your sudden hair loss; is it your diet? Is it a nutrient deficiency? Or, if you’re a guy, is it just male pattern baldness? Well for guys, the likelihood is that it’s the latter. You’ll need to check the signs of male pattern baldness to determine whether what you’re experiencing is just a normal part of life, or whether you might be suffering from a deficiency. For women, your genetics might just be causing your hair loss as well. Though this is less common than with guys and is more likely to be related to stress, hormones and nutrient deficiencies. To combat these nutrient deficiencies, you’ll want to try and find the best hair loss vitamins that can help improve the health of your hair. 3 Do hair loss vitamins really work? Before purchasing hair loss vitamins, you should be aware of exactly what it is that you need. These kinds of vitamins aren’t a miraculous cure to male pattern baldness – in most cases, these types of vitamins look to fill in any gaps that you may have in your diet. Things like Biotin can have an effect on hair loss if you’re deficient – these vitamins look to fill in all these possible gap deficiencies that you might have. 100% drug-free hair growth product. Physician-formulated, award-winning hair vitamins clinically shown to increase and improve hair growth. 81% of women saw increased hair growth and thickness in a clinical study. Promotes strength, shine, density, improved texture and less breakage. Multi-targets the leading causes of hair loss in women, helps rebalance the body to encourage healthy hair growth. Nutrafol is one of the better known names within the hair loss industry, especially within recent years. This is likely because they offer a similar product to many others out there, but at a much more affordable price than the competitors. 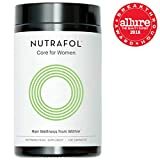 Nutrafol actually have two slightly different formulas – one created for men, whilst the other is created for women. The difference between them isn’t much, and they both contains several patented ingredients which make them a good choice. As opposed to simpler vitamins, Nutrafol contains a mixture of some of the best ingredients for hair health. 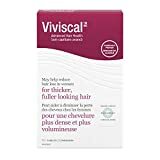 Viviscal is another of the most popular hair loss vitamins around – over the past few years, you’ll have seen it advertised by an abundance of different celebrities. Though Viviscal do make a male product too, their products are largely targeted at women, especially those who are experiencing temporary thinning. Whether stress related or otherwise, opting for a good hair loss vitamin is a good idea to give your hair it’s natural health back. Viviscal contains some helpful ingredients, like AminoMarC, Biotin and Apple Extract, which is also thought to help with hair loss. Many people believe Nourkrin to just be the UK version of Viviscal. Whilst this isn’t true – they’re completely different companies – the two do share many of the same ingredients. 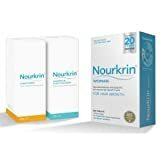 Nourkrin is more popular in the United Kingdom than Viviscal, as it’s more commonly found in their supermarkets and pharmacies. There are those that swear by the Nourkrin formula, and it’s worth considering if you’re on the lookout for some quality hair loss vitamins. Like Viviscal and Nutrafol, one of Nourkrin’s biggest ingredients is it’s marine collagen. THis is specially formulated and patented by each company, so we don’t know exactly what it consists of that makes it so effective. But, Nourkrin’s Marilex (their patented collagen) is sure to help improve the health of your hair and the rest of your body, too. If you haven’t heard of Sugar Bear Hair, you’ve probably been living under a rock. It’s been spammed all over Instagram in recent years, with tons of models and celebrities trying them out. 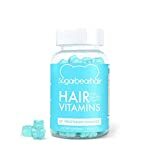 Whilst they might appear to be more a novelty more than anything else, Sugar Bear Hair gummies actually do have some really useful vitamins in them. With vitamins A through to E, Zinc and a whole host of other vitamins, they work well to ensure you’re getting enough quality in your diet. Overall, although the gummy bears themselves might be a little overpriced, there’s no denying that they’ll make a different in your daily diet. CONFIDENCE IN A CAPSULE: Do you dream of thick, lustrous hair? Beautiful hair is healthy hair, which is why our team of scientists, nutritional experts and formulators created HairAnew with 11 specially selected ingredients, to nourish your hair from the inside. This unique combination addresses nutritional deficiencies that can cause hair loss, thinning and slow regrowth, which can really give your confidence a hit. HairAnew provides the foundation for faster growing, longer, healthier hair. PERFECT TREATMENT FOR ALL HAIR TYPES: HairAnew is suitable for all hair types - straight, wavy, curly and coily - any color, any age, and works for both women and men. We've been selling HairAnew since 2014 and have shipped out more than 11 million capsules, so we're confident you should expect noticeable results within 30-60 days. You should also notice some fabulous additional benefits: stronger nails, thicker eyelashes and eyebrows, and more glowing skin! NO COMPROMISES: Every batch of HairAnew is manufactured to the highest NSF and GMP standards in a state-of-the-art facility in Oregon, USA. 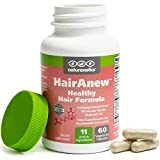 Unlike gummies, HairAnew is sugar-free, and unlike other hair supplements and treatments, it contains no collagen or animal products - it's completely vegan/vegetarian. It's also non-GMO, free of gluten and soy, tested for allergens, and absolutely never tested on animals. So you can trust you're taking the healthiest and most ethical product possible. If you don’t have the budget to be spending $30 on vitamins every month (which is a fair amount of us! ), then it’s worth looking at something cheaper. Hair Anew is one of the most popular brands available online, and a good reason behind this is due to it’s low expense. It has a lot of the ingredients that you’d find in any other hair loss vitamin, with tons of Biotin as well as Vitamin C, D and zinc. It states that it has the ’11 most important healthy hair ingredients’, and there’s no denying that these are some of the more important vitamins that you’ll want to ensure that you have a healthy scalp. If you’re on a tight budget, then Hair Anew is one that you might want to consider adding to your daily routine. GREAT RESULTS: Hairburst is the ultimate hair growth accelerator, taking our hair growth supplement will result in Increased hair length, Improved hair elasticity, Less Hair Breakage and shedding and Stronger hair. 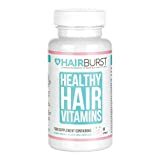 Hairburst are one of the bigger names in the hair vitamin industry, and you can find them in the majority of large health food companies like Holland and Barrett. This does give credibility to the brand, but also means that often they’ll run a little more expensive if you purchase them in store. Though if you do your research online, you can find some good deals for Hairburst vitamins. In terms of what they actually contain, there isn’t too much of a different between Hairburst and other hair loss vitamins out there. They do have an abundance of B vitamins though, more than any other hair loss vitamin around. This includes Thiamine (B1), Riboflavin (B2), Niacin (B3), Panthothenic Acid (B5) and a host of others too. It’s worth considering Hairburst if you’re after a staple hair loss vitamin that can undoubtedly work wonders for your hair. In all honesty, there isn’t a great deal of difference between many of the best hair loss vitamins around. They all try and fill in the potential gaps in your diet, and many of them contain the same ingredients. This is true for Hairfinity – their vitamins aren’y anything revolutionary, but they contain a lot of good stuff that you’re going to find useful in your diet. The only thing they do have that’s a little different is their Capilsana complex, which is a blend of amino acids (though there’s not information on what’s actually contained in this complex). 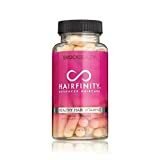 Overall, Hairfinity are another valid option to consider if you’re adamant about getting yourself some hair loss vitamins. Aswell as looking at some of the bigger hair loss vitamins that are on the market, it’s also worth looking at some others that you may also want to consider. You don’t need to necessarily consider purchasing these vitamins, as you’ll likely be getting them in your diet or in a multivitamin (which everyone should be taking at least once a day!). Biotin is probably the most commonly recommended hair loss vitamin, and there’s a pretty good reason for this. Whilst there aren’t any ‘clinical trials’ that prove that Biotin improves the health of your hair, it has been used to combat deficiencies for many years. If you are deficient in Biotin, then taking vitamins is the easiest way to get more Biotin into your system. You’ll find a lot of vitamins that contain Biotin amongst a million other things, but here I’m just recommending the vitamins that you’ll want to include in your diet to ensure that you’re getting enough of them – a deficiency can undoubtedly result in hair loss if you don’t get enough of some of these bad boys. There are tons of other shampoos you can use if hair loss is a concern of yours. Biotin is fantastic, not even just for your hair loss, but also for your skins and nails, too. Zinc is something that I can personally recommend after using it for several years. It’s great not just for the health of your hair, but it’s also great for your testosterone as a guy (I can attest to this!). For women, Zinc is fantastic to use during pregnancy and ensures proper growth. Whilst originally I liked to make sure I was getting enough zinc in my diet, I now prefer to take a zinc supplement as well to ensure that I’m getting my recommended daily allowance. Zinc has been used as an effective combatant to hair loss for many years now, as many studies have linked a lack of zinc to progressive hair loss. One of the more common issues that you might face with hair loss is scalp inflammation. This is common with a bad diet that isn’t rich in nutrients. If you want healthy hair and a healthy mind, you’ll want to consider some form of multivitamin and make sure you’re taking fish oil. As well as fighting against inflammation, fish oil is also great for the thickness of your hair. Dependant on the type of hair loss you’re experiencing, you may just want to find ways to help get your hair back to it’s former, thicker self. Fish oil is a fantastic part of any diet in which you’re looking to improve your health long term. You might think that you get enough Vitamin C in your diet because it’s found it citrus fruits as well as a lot of other foods. But, it’s easier than you think to become vit C deficiency. Vitamin C specifically works as an anti ageing vitamin, means that it can slow down the natural balding that will occur in the majority of males lives. A vitamin C deficiency has also been commonly linked with split ends and dry hair. This means that although a vitamin C deficiency doesn’t directly cause hair loss, it can cause split ends and dry hair, which will make you more prone to hair loss. Although you probably get enough Vit C during your day, it’s a safe bet to take a supplement or find a multivitamin that contains Vitamin C.
You’d be surprised at the amount of people who don’t get enough iron in their diet. It’s one of the most commonly diagnosed deficiencies, and it can cause hair loss (specifically diffuse hair loss and telogen effivium). Now, you don’t usually need a supplement for iron if you’re getting enough of it on a daily basis in your food. The easiest way to do this is by eating red meats like steak, and other meats like liver and poultry. Research does show that iron is more easily absorbed for meat eaters, though if you’re a vegetarian then you can get plenty of iron from eating your spinach and other veggies. If you don’t want to worry about getting enough iron in your diet, then you should consider a supplement as an iron deficiency is fairly common. This is why I’ve suggested it as one of the best hair loss vitamins you can take to help you maintain healthy scalp. Do hair loss vitamins really work? It’s a common question to ask whether these vitamins and supplements will actually work to help support the health of your hair. You’ll notice that I’ve only really mentioned vitamins in this list with little regard to supplement. This is because in my opinion there are many hair loss supplements that don’t really work. Some of them are marketed to say that you’ll magically grow your hair back within a week, when we all know this isn’t going to be the case. The vitamins that I’ve listed here are essential to both the health of your hair, and the health of your body in general. If you’re deficient in any of these vitamins, then it can definitely be a cause of hair loss. It is more likely that you’ll be deficient in certain vitamins than others, but it’s a good idea to take a good multivitamin anyway as this can ensure you’re getting enough of the most important vitamins and minerals. Genetics – The main reason that you may be experiencing hair loss is your genetics. It’s more common for you to be experiencing male or female pattern baldness than any other form of hair loss, so it’s important to realise this beforehand. Saying this, there are several other forms of hair loss you may be experiencing. Alopecia Areata – You might not have heard of alopecia areata before; it’s more commonly known as spot baldness. The causes of spot baldness are still not truly known. This type of alopecia can occur in small places on your head to your entire body, so it’s different in each circumstance. Usually, alopecia areata will go away on it’s own. Hypothyroidism – If your thyroid is underactive, this can be a major issue that may result in hair loss. It’s important to learn a little more about hypothyroidism and how it can affect you. Situational – There are an array of other circumstances which may lead to hair loss. Things like anxiety and depression can certainly cause hair loss, as can stress and a lack of sleep.If you’re experiencing any of these things, then this can definitely be a cause of hair loss for you. Dealing with hair loss isn’t easy. Before you purchase any vitamin supplements, it’s likely the best option to visit your doctor to try and find a cause. If you’re a guy, then the likelihood is that you’re just experiencing male pattern baldness. This is a normal part of life for most guys, and finding a hair loss cure is not likely to happen unless you’re willing to get a transplant (you can try Minoxidil to slow the process, but I’d advise you to just accept it!). For women, genetic hair loss is more common than you might think also. In saying this, all the things that I’ve listed here important nutrients in any balanced diet and it wouldn’t hurt to give them a try.